Partly in West Cork, and partly in Kerry, the Beara Peninsula is a majestic place to explore. Some of Ireland’s highest mountains are here, and in places they sweep sheer down to the Atlantic to create dramatic landscapes, hard to match – in my own limited traveller’s view – with anything else in the world, But it’s not just landscape: the Beara offers surprises in the way of rainbow-hued village houses, off-the-beaten-tracks pubs with lively music and conversation, and the occasional gem of an altogether different kind. 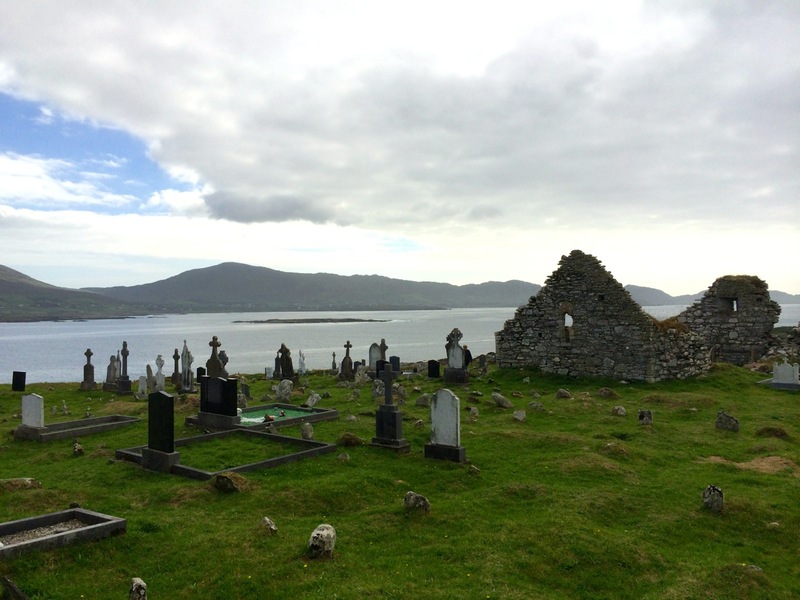 My post today is simply about one place – one church, in fact – which we found by chance in the village of Eyeries situated on the recently implemented long distance drive around the whole magnificent west coast of this country: the Wild Atlantic Way. ‘…Come to Eyeries Village. Embrace the tranquility…’ That’s the advice of this little community’s website. We did just that and, as we were enjoying our coffee outside Miss Murphy’s cafe in the centre of town we were only disturbed by one or two cars and diverted by the sound of the street sweeper’s brush. But the focus of our attention for this visit became the church: St Kentigern’s. 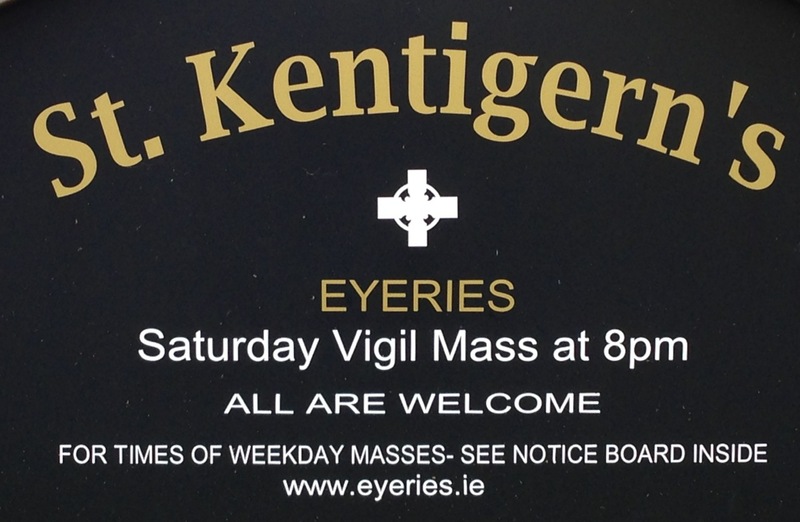 As you will know, I am always on the lookout for Irish Saints, and I had never heard of St Kentigern, so I went inside expecting to find a new story. My eyes were assailed by a riot of colour! This unassuming little building hides a magnificent set of coloured glass windows telling the story of the world from prehistoric times and Ireland’s central part in that history… I have put a precis of the artist’s explanation of the designs below, but the windows must speak for themselves. There are eleven windows in all: eight in the main body of church, two in the Sanctuary, and the last in the west wall, over the entrance doors. So – why are they here? A very good question. I have gleaned no information from the usual sources. The best I could find (based on a chat with a passer by) was that the windows were commissioned in the 1980s, and each one is dedicated to the memory of a local person, and they were all paid for by friends and relatives of the dedicatees. It seems that there was a wish at the time to ‘brighten up’ the interior of the formerly nondescript building. I think this aspiration has been completely successful, but it’s a shame that there’s hardly a mention of the church or its windows in any of the information I could find about Eyeries. 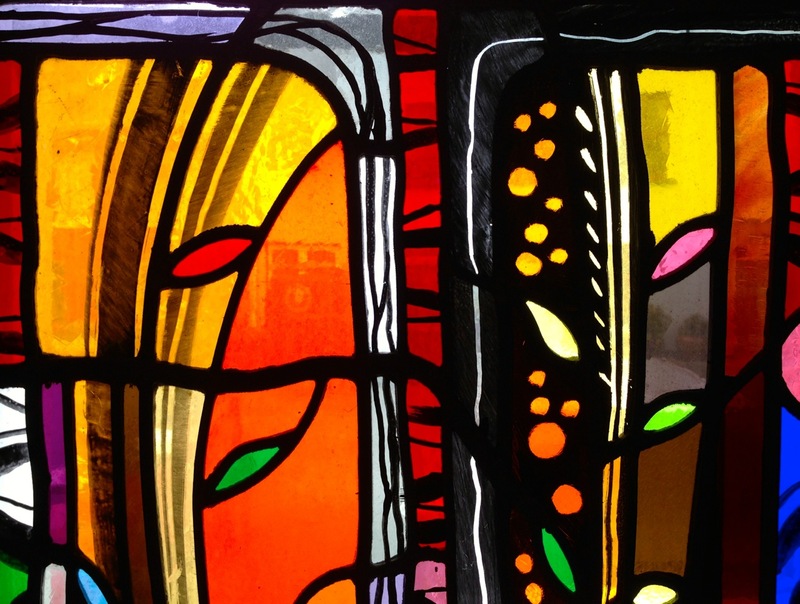 Regarding the stained glass artist himself – George Walsh: I have found mentions of him as an artist working in Dublin. His father, George S Walsh, worked in the studios of Harry Clarke. He has carried out commissions in Kerry, Kildare, Kilkenny, Dublin, Galway and as far afield as Newfoundland and Florida. My source thought that he is now retired and living in Dublin. It seems odd that he hasn’t gained more public recognition (unless I am missing something – comments please). What of Saint Kentigern? You may well ask that – he gets no mention in the church, nor in the Irish Saint Hagiographies. 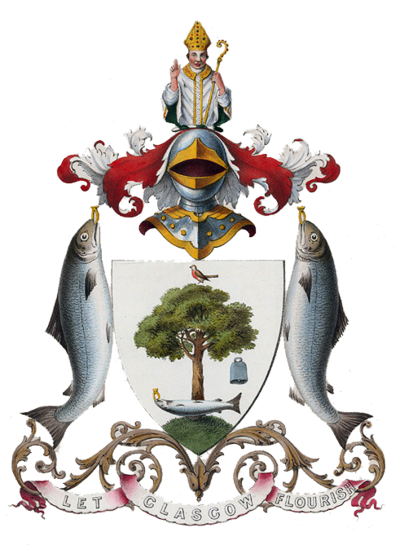 He is mentioned as a Scottish Saint (more commonly known as Saint Mungo) who founded the city of Glasgow in the 6th century. Look for him on that city’s coat-of-arms. I could only glean (from another local source after a bit of a grumble) that when the church was restored and the new windows were commissioned a priest of the time decided to give the church that dedication. He evidently had unearthed some obscure link, but this has apparently never been put on record. There is another possibility: he might have been the local saint whose name is now more commonly given as Chaitighern or Catherine. There is a ruined church of this dedication on the Beara, not far from Eyeries. This entry was posted in Architecture, Beara Peninsula, Eyeries, Religion, West Cork Blog and tagged Founder of Glasgow, George S Walsh, George Walsh, Glasgow coat-of-arms, Harry Clarke Studio, Irish Stained Glass Artist, Kilcatherine Church, Patron Saint of Glasgow, St Kentigern, St Kentigern's Church Eyeries, Stained Glass, Wild Atlantic Way. Bookmark the permalink. Stunning. I am so glad your recent post led me back to this. I discovered a George Walsh window in St Manchan’s Church, Boher, near Ballycumber, Co Offaly. Somewhere I have a photo I took of the George Walsh window which I’ll post when i find it! Thanks!! We hope to see that one soon. The door was locked the day we were there. The saint appears to be as unassuming as the church and its windows. Both give our heritage depth of meaning. Your discovery Robert, leaves me silent, yet full of respect for these ‘towering’ little places and the people who built them and love them. One of my favourite posts, what is there not to like seeing this and reading about it over and over. The colours of the glass massage my eyeballs. Ref : The whale. On reading the Brendan voyage, the seas, around the Scottish leg of the journey, were were full of whales, so many one could walk on their backs to dry land. Thank you, Brendan. It has certainly been a popular post and is looked at over and over again – yet it was written in 2014! Finola has a piece on the artist, George Walsh, coming out in the Irish Arts Review in march. … and the buildings in the Eyeries are as colourful as the windows in the church! 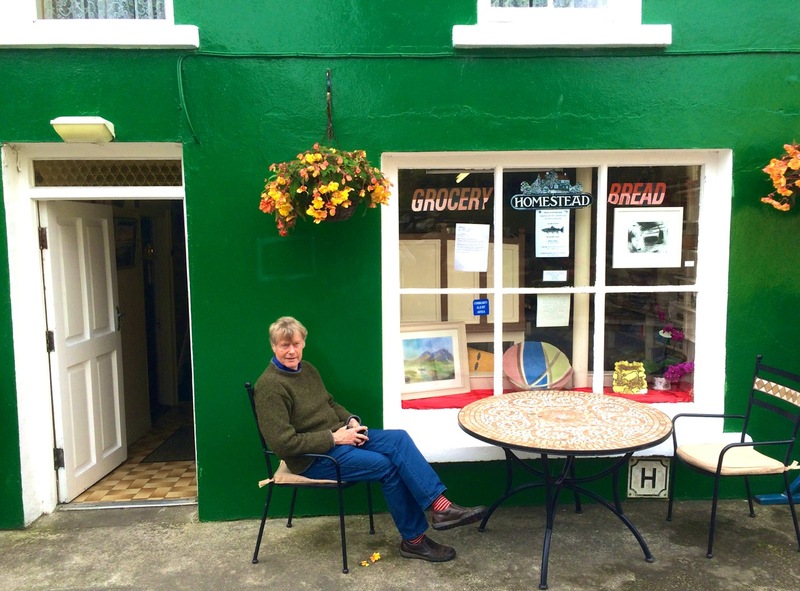 Many thanks for sharing these splendid photos and adding yet another place I visit if/when I come to West Cork! Yes indeed Eyeries is a very pleasant spot in Summer but I wouldn’t want to spend a Winter there! The color in those windows is stunning. Wish I could get to see them someday. Thanks for bringing them to me. These are just fabulous! We missed this little gem, but loved Eyeries when we went – a good excuse to go again. Could the connection be via Cornish tin miners? Can’t find any specific links in Cornwall – but there are plenty of historical connections between Ireland and Scotland. And who knows how things travelled from one community to another in Medieval times? Thank you for commenting. I wonder has Dora seen these windows?